If you want good investment performance, forget you have an account. On this week's Masters in Business program on Bloomberg Radio, Barry Ritholtz talks with James O'Shaughnessy of O'Shaughnessy Asset Management. Ritholtz and O'Shaughnessy spend much of their discussion talking about the ways people screw themselves when investing, because nothing gets in the way of returns quite like someone who thinks they have a great idea. O'Shaughnessy discusses a number of interesting analyses he has done with regard to the length of holding periods (spoiler: the shorter you hold a stock, the more likely you are to lose money) among other things. But O'Shaughnessy relays one anecdote from an employee who recently joined his firm that really makes one's head spin. O'Shaughnessy: "Fidelity had done a study as to which accounts had done the best at Fidelity. And what they found was..."
O'Shaughnessy: "...No, that's close though! They were the accounts of people who forgot they had an account at Fidelity." There are numerous studies that explain why this happens. And they almost always come down to the fact that our minds work against us. Because of our behavioral biases, we often find ourselves buying high and selling low. Ritholtz also follows with some of his experiences in estate planning, where a family fighting over some inherited assets might not touch them for say 10 or 20 years while they work out the problem, and later find that those 10 or 20 years are the best period of performance. The absolutely terrible investment decisions that people make are something that just can't be emphasized enough. 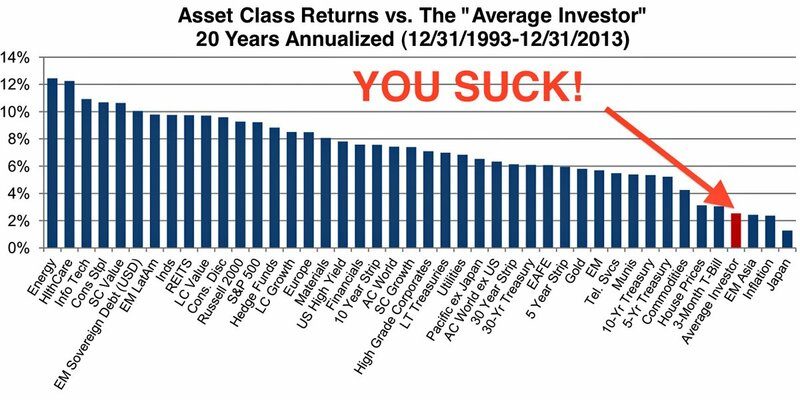 We recently highlighted this chart from Rich Bernstein that shows just how terrible you are at investing: don't forget it. I have watched my stock portfolio drop 7% in the last two sessions. Thanks Brexit! People make far more money selling stocks short on any bad news than the hold for gains strategy. I am beginning to think Mutual funds are becoming obsolete in today's market. I think a huge part of our retirement problems lie with blindly investing. This will get ugly quickly. Na, I doubt it. We've had a number of discussions organically in other threads, and it's always been cordial. **** you and your uncle, eyeball! This is a no brainer buying opportunity. Scrape any extra money and dump it into ANYTHING. When blue jeans go on sale, people buy. When the market goes on sale, people run. I won a $50 Amazon gift card for taking a survey, so that's pretty nice. I wish I had some savings and 401k. It's tough to have fun on a budget that doesn't include booze, strippers, and gambling. At the same time, the stuff I've read suggests that that isn't necessarily the optimal approach either. If you buy today, you really have no idea if it'll continue to slide (in which case you should've waited even longer), and if you buy tomorrow, you might have lost out on any gains that happened today. As boring as it sounds, the best approach is often just to keep doing what you've always planned to do regardless of what happens. Lloyds banking and other financial stocks down by as much as 25% in 2 days. That was my point-the money was made on the way down-not trying to time the bottom of the market and hold until it corrects. How long will it take Lloyds to gain that back? I thought CS and DB had bottomed out, but they just got hammered again. I lost over 5% in my RBC stocks and BMO that killed the slow gains from a month of steady climbing. I will get a nice dividend in a few weeks that will be reinvested at the lower stock price-but it is still crap since they are some of the most solid banks in the world and have a low exposure to Europe compared to most other banks.